Built in 1894, the Hope Fire Company building has served a variety of community uses in Mays Landing, Hamilton Township. The building was originally constructed, thanks to a partnership between community tradesmen, as the headquarters of the Hope Fire Company, later known as the Reliance Hose Company No. 1. The wood-frame Carpenter Gothic style building was serving a dual purpose as early as 1906 when a school was located on the second floor. 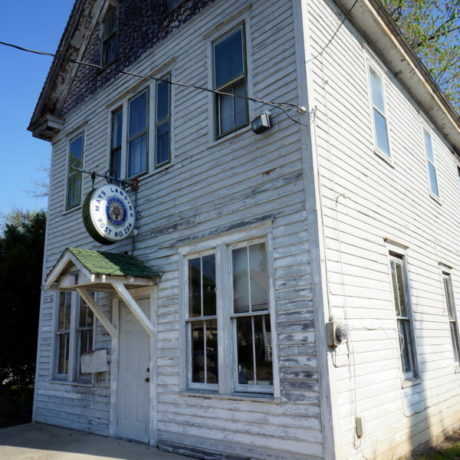 The local fire company moved to a new location in 1927, and soon after, the township moved municipal offices to the second floor and began leasing the first floor to the American Legion, which would continue to lease the space for the next 82 years. The property was owned by the township until 2009 when the municipality transferred ownership of the building to the American Legion Post 254 in a “deed of gift” transaction. The Hope Fire Company building has been poorly maintained for many years and is threatened by neglect. In 2008, an analysis of needed repairs was completed and approved, but those repairs were apparently never undertaken. The building is badly in need of a new roof, as well as extensive repairs to the cornice, windows, siding and many interior elements. The building’s deteriorating brick chimney is currently being kept standing with a metal bracing device that runs through the roof and attaches to a single rafter. Prior to the American Legion Post 254’s ownership, a lack of heat in the building caused the pipes to freeze, disabling the plumbing system. As such, Post 254 cannot currently hold meetings or events there, although they do store some historically significant records and documents in the building. The American Legion Post 254 has performed minimal maintenance work since acquiring ownership of the building. While the organization would like to undertake the necessary repairs to make the building structurally sound and usable, it does not have the funding for the extensive work needed. A few years ago, the Post had secured a commitment of donated roofing supplies and volunteer labor for some of the repair work, but a temporary snafu with the group’s nonprofit status (since resolved), along with the ailing economy, stalled those plans. The Hope Fire Company headquarters is a highly visible contributing building in the Mays Landing National and New Jersey Register-listed historic district. Because it is in a district that is listed on the New Jersey Register of Historic Places, there are questions as to whether state law was properly adhered to when the township gifted this property to the American Legion. Local advocates contend that the township did not submit plans for the sale to the NJ Historic Preservation Office for the appropriate review, a requirement when a public entity undertakes a project, including sale, that impacts a New Jersey Register-listed property. Regardless of how this issue is resolved, quick and aggressive work to seek funding is needed to save the Hope Fire Company from demolition by neglect. The New Jersey Historic Trust is one source that offers grants to non-profit and public entities for restoration, and creative independent fundraising could help generate the required matching investment. With the guidance of the Hamilton Township Historic Preservation Commission and the previously-completed analysis, appropriate, necessary repairs can be prioritized and restoration completed, ensuring that this important building returns to active use and continues its long tradition of public service.